A storm is coming, and Noah’s family is preparing. His father is boarding up the windows, his mother bought groceries, and his sister is filling empty milk jugs with water. 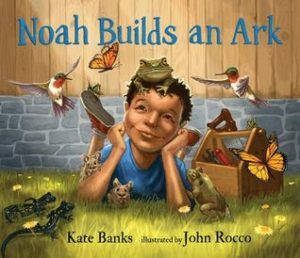 Noah decides that the animals that live in his backyard need a safe place during the storm and converts his red wagon into an ark. The storm is fast approaching, and Noah has little time to prepare. Will his ark protect the animals and is there enough food for them to withstand the storm? Read “Noah Builds an Ark” and find out. I found this a cute story that connects readers to the classic Bible story of Noah and the Ark but also individuals who experience powerful weather storms. An adult can use this book and inform the rising generation that if they are prepared, they will not fear. This book can also be used as an analogy that emotional storms are scary in the moment but will eventually pass.